From an analysis and review standpoint I am forever railing against recency bias. This “railing” comes about however because of its pervasiveness. It’s an in-built near automatic response. And of course I fell into the trap myself. Watching the Mayo – Roscommon game last week Cillian O’Connor missed a central free about 33metres out and I had immediate flashbacks to (a) a number of missed frees in the previous round against Kerry and (b) that missed free in last year’s All Ireland final. Was this latest missed free a sign of some cliff having been reached? Was one of Mayo’s most consistent weapons beginning to malfunction? Of course not. In the three league games to date O’Connor has hit 79% of his frees. Well above the ~72% Championship average. On Expt Pts his tally is -0.39; he has basically scored what is expected. Now the argument could be made that someone with O’Connor’s reputation should be in positive Expt Pts territory. Fine. However we must always remember that the Expt Pts tally is based off Championship returns. Frees taken in (mainly) pristine weather on (mainly) pristine surfaces. O’Connor is fine. To be slightly off in the middle of the league is acceptable? For comparison Dean Rock is running at 75% conversion rate with an Expt Pts tally of -0.86. What I did argue however in last year’s All Ireland review is that O’Connor had an arc outside of which he was vulnerable (the missed free in the drawn All Ireland being right on this arc). Given weather, pitch conditions etc. it is fair to expect that arc to contract at this time of year and if we placed this contracted arc over O’Connor’s frees to date then I would suggest that arguement is still relevant. He has taken 6 frees on the edges of this constricted arc and converted 3 – 50% Success Rate. He has also missed his only 45. So in conclusion – bloody recency bias!! But O’Connor is generally fine and still remains one of the most consistent free takers once within his range. 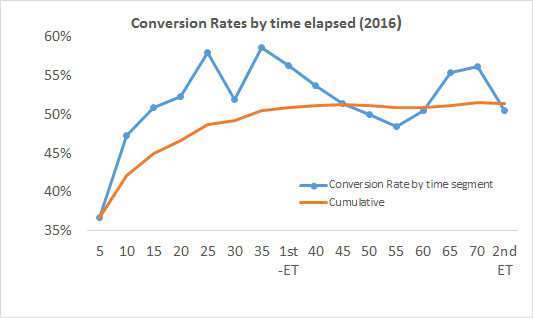 Early Conversion Rates are poor – why? Whilst uploading the 2016 data into the database I was noodling around in the numbers and produced a simple chart for production on Twitter. The phenomenon (of Conversion Rates being lower early on) was observed in three of the four semi-finalists (NOTE1) whilst all other teams followed the overall trend to a tee. The only outliers – unsurprisingly – were Dublin. 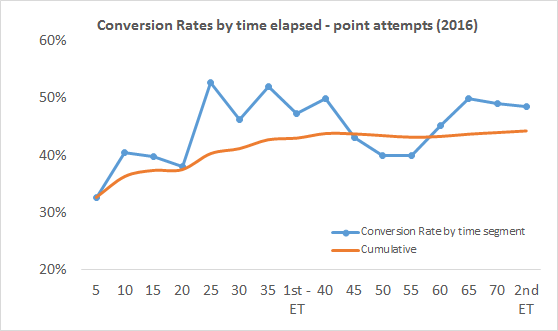 The above is a replica of the Conversion Rate chart but replacing Conversion Rates with Expected Points (Expt Pts). Although the shape of the chart is different than the original the occurrence of poor early returns is still evident. And by using Expt Pts we remove the shooting types as an issue as Expt Pts bakes in the difficulty of a shot (NOTE2). All shots are being converted at a lower rate than expected until around the 30th minute but teams are noticeably struggling in the first 15 minutes. So the phenomenon is real but cannot be attributed to a specific team type nor to shot selection/execution. It is across the board except for Dublin. Three shots types – free kicks, point & goal attempts from play – make up ~97% of all shots. Is there anything we can determine from investigating these shot types independently to explain this poor shooting in those early exchanges? And is there anything therein that explains how Dublin are managing to avoid this poor shooting early on? This is probably the most surprising, and hardest to attribute, of all the results. When the very first chart was produced on Twitter I mischievously suggested that whatever all the back-up teams were doing to get teams warmed up they needed to change it. There were some good responses re the intensity of teams, especially in the pressure applied to shots, being higher early on. Or that teams were defensively more conservative early on leaving less space for clear shots. All plausible and probably have a grain of truth. However none applicable to free kicks – and the phenomenon of poor conversion rates early on is noticeable here too. Now by slicing the volumes into the first 10 minutes of one season’s games we are running in to sample size issues. Specifically for this segment the volume is 47 so this comes with a rather large health warning. Assuming games are now 80 minutes the first 10 minutes make up 12.5% of the game; the 47 frees in the first 10 minutes make up 13% of all frees. On top of that the two main free takers – D Rock & C O’Connor – make up 21% of all frees in the first 10 minutes whereas they make up 25% of all frees in the database for 2016. So the first 10 minutes, low sample size and all, are representative of the whole year. So what happens in those opening 10 minutes? What the above table shows is that Rock & O’Connor were on point from the get go. Overall for the year they combined for an 86% Conversion Rate and in the first 10 minutes they were 90%. If the two main protagonists were on point the rest of the free takers must be dragging the averages down from 71% overall to 62% in the first 10 minutes. And as the table shows this is the case. Indeed they were very poor returning a paltry 54% (the 80 minute average for all free takers outside Rock & O’Connor was 66%). And this somewhat negates the argument for lower Conversion Rates early on being affected by what the opposition’s defence is doing. The opposition can’t really affect free taking. Outside of Rock & O’Connor it looks like free takers were just not ready early on (NOTE3). The Conversion Rate for 2016 was 44.2% and for the five years from 2012 was 45.8%. 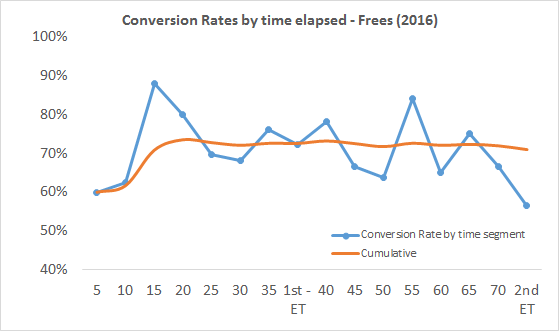 For the first 10 minutes of 2016 games the conversion rate was 36% and only rose to a cumulative 38% by 20 minutes. 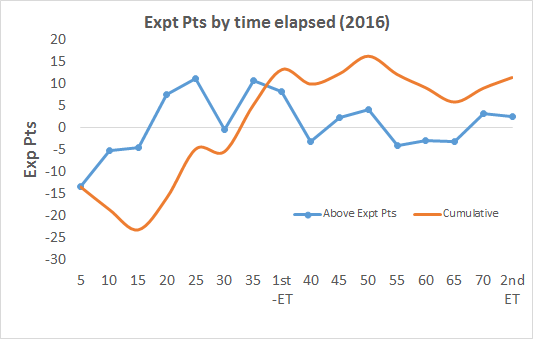 Again the Expt Pts was lower in the first 10 minutes (-15.70) as against the remainder of the game (+5.84). I do track whether a shot was taken under pressure however have only used it anecdotally to date as it is a simple “Y/N” flag and is probably not nuanced enough for any concrete use. Having said that however there is only one person applying the flag so we would expect a certain degree of consistency of application across the ~1,000 shots tracked here. In the first 10 minutes I charted 53.6% of all point attempts occurring whilst under pressure. The remainder of the time it was 54.2%. Near enough as makes no difference. So the poor shooting for points from play is real, is not linked to poorer shot types (as evidenced by the Expt Pts return) and from the empirical data we have is not linked to greater pressure applied earlier on in the game. I am completely open to the intensity of the pressure being different early on (NOTE4) but if this was the case you would expect some uptick early on in the percentage of shots marked as taken under some/any pressure in this timeframe. There is none. There may be other non measurable factors such as nerves (these are amateurs after all) but as of now I can’t come up with anything other than the aforementioned “mischievous” reason that players are just not at peak performance early on. Maybe this is to be expected? So what of Dublin? We saw that their early conversion Rates outperformed everyone else. This is in part due to the fact that Dean Rock went 5 from 5 on his frees but how was their shooting from play? Again volumes are low (NOTE5) but Dublin were no great shakes early on. Yes they were above the average for the first 10 minutes but they still underperformed when compared to the whole game average and their Expt Pts – like all the teams above – was below 0.00. Perhaps the most striking return here is Mayo. 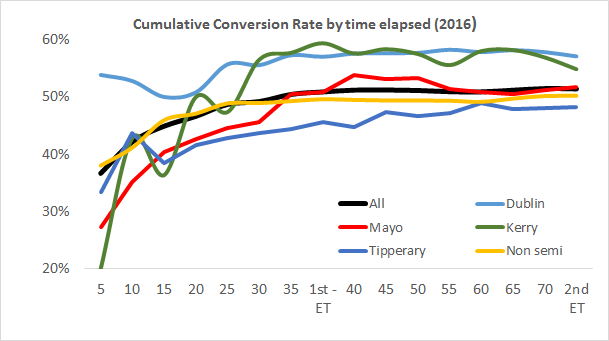 From the 10th minute onwards they were exactly in line with Dublin (Mayo 49% on 126 shots with an Expt Pts of +5.59; Dublin 49% on 132 shots with an Expt Pts of +5.54) but for those first 10 minutes they were much poorer. Another theory for the poor start was not where teams were shooting from but who was shooting – less pressure on returns early on so midfielders/defenders were more inclined to “have a pop”. So I had a look at Mayo’s shot distribution. In the first 10 minutes 64% of their shots came from what I would state are obvious offensive players (A Moran, A O’Shea, J Doherty, A Dillon and the two O’Connor’s). From the 10th minute onwards, and adding E Regan, C O’Shea and A Freeman to this mix who didn’t have a shot in the first 10, these forwards accounted for 60% of point attempts (NOTE6). It is difficult to attribute offensive/defensive tags to all players in today’s game but if there was a decisive split in who was shooting for teams you would expect it to show up in the team with perhaps the worst split. But it doesn’t. To be honest I am just including the above for consistency and to help explain Dublin’s apparent ability to start faster than others. Whilst I have consistently cautioned against low sample sizes it is an overarching feature of this shot type and can explain a lot of the variance within the five minute groupings above. In total there were 137 goal attempts with just 15 in the first 10 minutes and 36 within the first 20. Having said all that …. 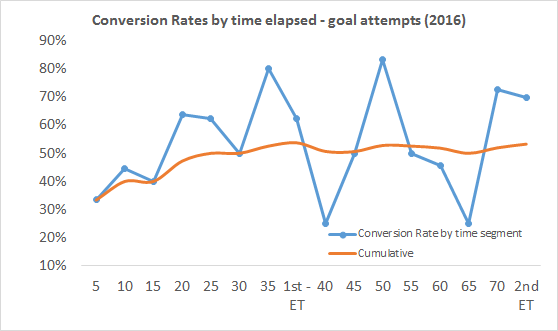 the Conversion Rate for goal attempts was 53% in 2016 and only crawled up to 40% after 15 minutes. With the evidence we have teams again were not converting on goal attempts early on in games. Dublin? They had six goal attempts in the first 10 minutes scoring 3-00. 50%. And there is their apparent early start in a nutshell. They were 50% on goal attempts, 100% on deadballs (as well as Rock’s aforementioned frees he was 2 from 2 on 45s as well) and slightly below average at 39% on point attempts – giving them the aggregate of ~52% early doors. It is also evident in early free taking, except for the very best in Rock & O’Connor who were on point from the very start, which somewhat nullifies the theory that it is something the opposition is doing to affect the shooting. There are undoubtedly other factors at play. Some can be measured; first shot in the game, effect of new surroundings, debutants vs more experienced players, intensity of pressure. Some we may never be able to measure – nerves, mentality of players early on versus later in the game, etc. NOTE1 – we need to be careful with any segmentation. There are only 1,640 shots in total being reviewed here with 249 in the first 10 minutes. Segment that further by team and you get some ridiculous numbers; Kerry just have the 7 shots across two 2016 games; similarly Tipperary only have 16 shots in the same timeframe. You can’t make any judgements on those numbers. In truth I would not normally use a chart with such low volumes but I include it here as it was the chart that sparked me into looking deeper into the issue. NOTE3 – I had a further look at the non Rock & O’Connor frees to see if any one player was having an effect. There was none really. 34 of the 37 were a player’s first attempt in the game which makes sense as it is uncommon for a team to have two shots at goal from a free in the opening 10 minutes. This leads to a further corroboration that could be investigated – across the year’s how does a player’s very first free kick equate to the rest of their results? NOTE4 – I started to grade pressure on a sliding 0 – 3 scale for the two All Ireland finals. It feels a lot more robust as having to apply a grade makes you stop and think. It will be very instructive from here on in but as of now I’m not inclined to go back over the entire season to retrospectively apply the grade(s)! NOTE5 – This table lists all the teams with >10 shots from play in the first ten minutes. Again we are running into sample size issues. Note that whilst some of these could be moved into the “offensive” pot their individual shot volumes are such that it wouldn’t make a material difference to the overall point. Time for the annual review of how the season’s shooting went. In truth 2016 was an average year. The three shot types listed above account for 96.4% of all shots and whilst there is some movement in each category there is nothing that really warrants further investigation. This has been *the* most stable metric since the inception of the blog and 2016 was no different. Slight uptick but nothing exceptional. We looked at the 2014 increase here and, at the time, attributed it to better accuracy for closer in frees. 2015 saw an increase in accuracy for point attempts however this was a blip rather than the beginning of any trend as 2016 returns slipped back to 2013 & 2014 levels. The step up in accuracy observed in 2014 & 2015 was maintained in 2016. Teams have definitely become better at getting a return from their goal chances but not necessarily at their finishing. The above table includes any goal shot that returned a goal or a point. If we strip out the points then the goal conversion rate is 35%, 32%, 36%, 41% & 40% respectively. The step up in 2014 & 2015 is evidenced again however was maintained, rather than built upon, in 2016. The dearth of GAA data can lead to some curious problems. Take measuring the best free takers for example. Normally all we get in any match report is a list of the scorers and how many of those scores were from frees, 45s etc. Rarely will their scores be put in the context of how many shots they had, how hard these shots were etc. Is the best deadball exponent (although frees make up well in excess of 85% of all deadball attempts we really should introduce penalties & 45s into the conversation) the player that scores the most? The one that converts the most? Neither? In and of itself this is noteworthy. Many would have placed the likes of McManus & O’Connor at the top of the charts but the long range experts such as Sheehan & Cluxton, who would also have had their proponents, are lower down the rankings. This does highlight an issue with using Conversion Rates as shot difficulty (both in distance & angle to the goal) is not taken into account. Of Cluxton’s 56 attempts a remarkable 71% (29 x 45s & 11 x frees) were taken from the 45m line or further out. 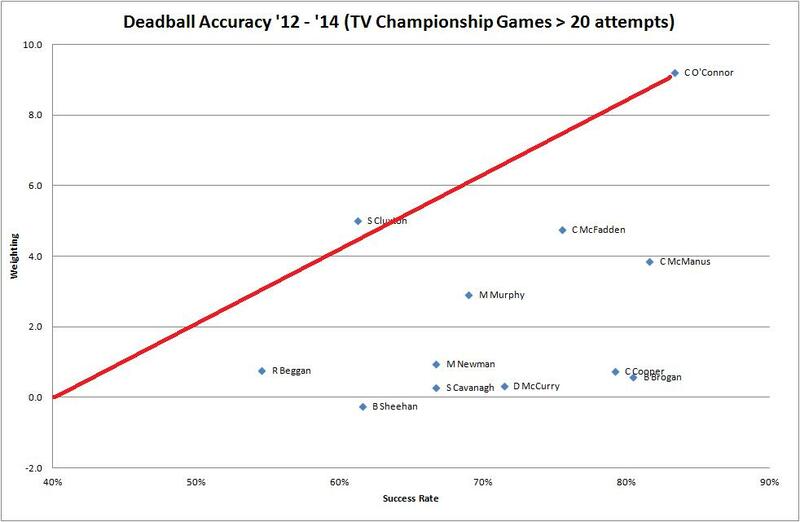 As a point of comparison only 10% (4 x frees & 1 x 45) of McManus’s 48 attempts were taken from the same range. How does McManus’s 81% Conversion Rate stack up against Cluxton’s 55%? Would we say that McManus is that much better of a deadball striker? By dividing the pitch into segments, and using the results of well over 1,400 attempts, we are able to show what percentage of deadballs are scored per segment. We use this percentage to create an Expected Points (Exp Pts) return – along the lines of Expected Goals for soccer – for every attempt. So if a free from a specific area is converted 60% of the time the Exp Pts = 0.6pts. Doing this for every deadball attempt then allows us to compare players on a more equal footing. This shuffles the ranking somewhat. The aforementioned Cluxton & Sheehan rise up the leaderboard as the difficulty of their respective attempts is filtered in. We also see the reverse as players with higher Conversion Rates drop down the ranking – Rock & Brogan noticeably. Brogan is interesting. He only attempted three free kicks in 2015 meaning that the majority of his returns were pre the emergence of Dean Rock. Looking at the above it is easy to see why the free taking duty was passed to Rock. Although Brogan’s Conversion Rate was high at 78% – placing him 4th overall – the negative Exp Pts shows that he was missing too many easy chances. Of his 48 attempts 22 (46%) came from inside the 20m line; and he missed five of those. Not that Rock is without his issues. In 2013 & 2014 he was an excellent 92% (11 from 12) on frees though this tally was racked up late on in games where the result was never in doubt. He started 2015 in similar form converting 93% of his first 14 however he then tailed off in the later rounds missing three of his last seven against Mayo & Kerry. Dublin have not looked to cultivate a free taker during the league campaign, so they have faith in Rock, however we won’t know if his late 2015 misses were just a small sample size or something else. If it occurs late on again when the pressure is at its most intense will Dublin be able to switch? Brogan, whilst an able deputy, is no better than average whilst Cluxton only hit one from seven in the semi-final onwards last year after coming in cold. One of the more noticeable aspects of the Exp Pts table is how Cillian O’Connor & Michael Murphy rise to the top. The argument can be made that the more attempts you have the easier it is to build up an Exp Pts tally – that of course ignores that the opposite is also true. The more attempts you have the greater the opportunity to regress to the mean. That O’Connor has maintained such standards across multiple Championships is a remarkable feat. Even more so when you consider that the methodology does not account for the majority of his attempts occurring in high pressure games (Provincial finals, All Ireland semi-finals & finals) whilst also being a load bearing totem. He has taken 76% of Mayo’s deadball attempts switching from the left to the right as well as taking high pressure penalties and the majority of Mayo’s 45s. O’Connor’s consistency is beyond reproach and it is this, alloyed to his proven accuracy, that surely gives him the title of “the best free taker”. NOTE: Due to space limitations I wasn’t able to expand on certain points in the article. One I wanted to address was E O’Flaherty’s returns. The above paints him as a very poor free taker which is incorrect. He is in fact a very good free taker but within his wheelhouse. 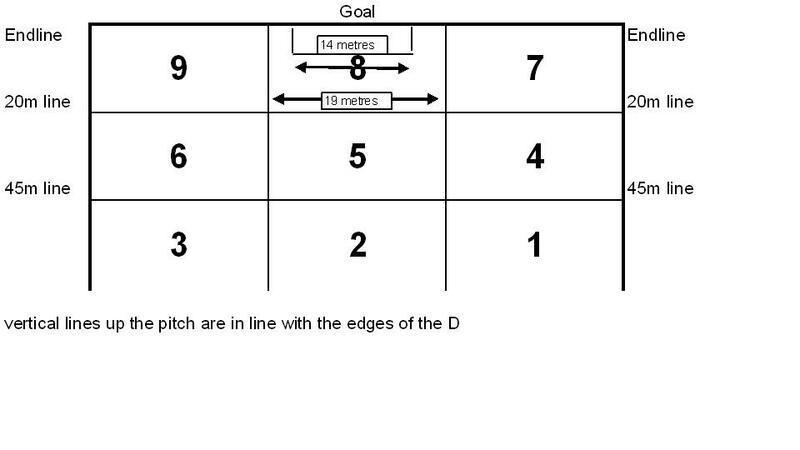 By that I mean between the two 20m lines and to the left of the goals. The problem was that for years Kildare did not have a left footed free taker – or a long range one for that matter – so he was being forced to take shots that other designated free takers did not. An article by Martin Breheny during the week had a pop at Mickey Newman for not taking a 35m free from the ground (it’s the O’Byrne cup. In January!). Kevin Egan (@lonesharkoy on twitter and a great read in his betting columns for betswot) bemoaned the fact that the article was based on a sample size of one. One! And that maybe, just maybe, Newman might know what’s best for him when taking a free. This is old ground. Conversion rates for frees from the hand and the ground were covered in two early pieces (see here and here). Just like now the catalyst for the original piece was commentators bemoaning the lack of a particular skill. The Breheny article, and discussion on Twitter in its aftermath, got me curious as to whether the results of the initial study had changed at all now that we had so much more data. The short answer is it hasn’t. Overall players convert frees from the hand at a 20% rate better than from the ground. That 20% gap is a bit sensationalist. Where frees are taken from does have an impact on overall conversion rates. The majority of frees (78%) taken from outside the 45 are taken from the ground. Frees from outside the 45 are converted at a relatively paltry 38% so including these will automatically dampen the results for frees from the ground. If we exclude theme does it change anything? The answer is yes and no. Yes the difference between the two is narrowed significantly but the central tenet holds true – players are better at converting from the hand than they are from the ground. Indeed the gap has grown slightly from three years ago when similar splits saw results of 79% from the hand and 68% from the ground. Shot attempts are further segmented by sector (see sector breakdown here) so we are able to take a more granular look. Frees from the hand not only outperform those from the ground but do so in all sectors. Including, perhaps a touch surprisingly, the very central ones. I say surprisingly because with frees out wide I can understand how players taking them from the hands make it easier on themselves by stealing a few yards. That doesn’t really enter the equation with the more central ones. As stated in 2013 I have no problem with people lamenting the loss of a skill but surely Mickey Newman, or any free taker, knows the best way to approach any particular free? The fact that the numbers back up using your hands is just a nice happenstance. What’s the betting we will be revisiting this in 2017? Originally this was going to be a follow up to the deadball accuracy piece in which I would highlight any interesting tidbits that had popped up whilst reviewing the past three years. Instead it is going to be an ode to Cillian O’Connor. Attached below is the chart I initially posted on twitter (@dontfoul) showing the accuracy for the players with the ten most attempts since 2012. O’Connor came out on top in terms of Success Rate. But he did so whilst also attempting the most deadballs. He had volume on top of his accuracy. He also maintained this accuracy in some of the most highly pressurised situations. In the three year span that the returns covered Mayo have appeared in 13 TV games with three quarter finals, four semi finals and two finals amongst them. Most impressive. What is even more impressive is the fact that O’Connor has recorded the highest weighting in this interval as well. He is not just tapping over simple 14m frees to maintain his Success Rate. His weighting reflects the fact that he is converting frees of an above average difficulty at an above average frequency (as a counter point note Bernard Brogan – a well above average Success Rate but a barely positive weighting – he is merely converting the frees that an average free taker would convert but because of Dublin’s volume of attacks he gets to take more frees). It is not just volume that is leading to a higher weighting either. On current trajectories only Cluxton is in line with his weighting. So how has he done it? O’Connor’s accuracy is above the average in all three of the deadball categories – frees, penalties & 45s – that he has attempted. His weighting has been aided by converting three penalties (for a longer explanation on why penalties have such high weighting see here) but on the flip side he has attempted three frees from outside the 45 for which he patently does not have the “legs”. As an illustration see a chart of all his deadballs, excluding penalties, this year. O’Connor’s only missed two frees from inside 40 metres in 2014 and one of those was the desperation goal attempt in the semi final replay at the end of extra time. His accuracy from c40 metres in is genuinely exceptional. This was originally published over on livegaelic before the season started – I meant to put it up here but have only gotten around to it now. I have been gathering data on Championship games since 2010. Unfortunately I do not have any games from 2011 however for the other three years 86 games have been charted with 6,593 attacking possessions and 4,805 shots recorded. There have been minor adjustments over the years as to how the data is gathered. Where this is the case any extrapolation will be highlighted. We also have to take into account the fact that all the games are charted manually so there will be errors and inconsistencies however I am confident that they are minimal as (a) I don’t do games live and have the benefit of time to review and check and (b) I do all the games myself so how I interpret actions (a shot, or pressure for example) will be relatively consistent. There are a few things that jump out from this one table alone. The main one is the contrast between 2010, in terms of average possessions per game and Shot Rates, and 2012 & 2013. They are quite a way apart given how consistent ’12 & ’13 have been. The Shot Rate gap does shrink but the Avg. possession rate remains stubbornly different. We do know that football is a copy cat game – 2011 saw the emergence of the Donegal wall as well as a tempered Dublin. It could be that following both those teams’ success an emphasis was placed on minding the ball. Recycling the ball and attempting to take more quality shots, rather than a greater quantity of shots, seems to be in vogue. As an aside it is interesting to note that the higher profile games – quarter finals onwards – where one would expect more evenly matched teams brought about higher Success Rates. Despite, in theory, these games possessing better defences the Shot Rates remained relatively static in ’12 & ’13 but the Success Rates increased. At a very, very generalized level the better forwards outperformed the better defences. Before we move on to looking at the various shot types below is the outcome of all shots from play. There is a remarkable consistency to these outcomes. 44-46% of all shots end in a score (goal or point) whilst 33 – 34% of all shots were wide each year (note that in 2010 all shots that hit the framework were considered wide … these were separated in ’12 & ’13). Now we know that the type of shot will have a big bearing on the Success Rates however if you are a member of a club then by simply tallying the outcome of your team’s shots you will know how far off inter county standards your team’s shooting is. The only real “trend”, and it is a minor one overall, is the fall in the number of shots dropping into a goalkeeper’s hands. It has fallen from 7.4% of all shots in 2010, to 5.8% in ’12 and 5.4% in ’13. I would be surprised if this was due to anything other than teams preaching a mantra that emphasises minimizing turnovers; the belief that it is better to kick the ball wide, and set for the kickout, than let your opponent start a counter attack when the team is not ready. It would be interesting to see how many shots a team gets from possession garnered from balls dropping into the keepers hands versus from kickouts. Another one to add to the ‘to do’ list. Knowing that 45% of all shots from play end in a score is useful. It can be used as a convenient benchmark. However there are a lot of other factors that feed into whether a particular shot will be successful or not; strength of the wind, where on the pitch the shot was taken from, rain, strength of the opposition, whether a defender was placing the shooter under pressure to name but a few. A lot of these are subjective (pressure?) whilst others are difficult to gauge watching games on tape (how do you grade various wind strengths). One factor we have been able to consistently capture however is where on the pitch a shot was taken from. I have always used the above segmentation and whilst it has its drawbacks it has two major strengths. One it is objective as all pitches are marked the same and two it is readily transferable across grounds and broadcasters. No matter the camera angle, or trajectory of the sun, you will rarely struggle to place a shooter in the above grid using the pitch markings. Having said that how do Success Rates for shots for points for the various segments line up? The returns for 2010 from Sector 8 are blank as there was no distinction between shots for goals and shots for points in that year. Alongside the returns it is instructive to review where the volume of kicks were taken from (see Appendix). For shots from outside the 45 (Sectors 1-3) there is a lot of volatility; this is purely due to low volumes however. Only 2% of all shots – 77 shots in 86 games – in the three years occurred outside the 45. It is very difficult to extract anything meaningful from this data. From year to year there have been fluctuations on the returns from the wings (Sectors 4 & 6) however over the three years there is no difference. Whether kicking from the left or the right the Success Rates are 36%. As a grouping Sectors 4 & 6 combined produce the most shots (38% across the three years) but the returns are relatively poor. It is not a case that as a trainer or coach you tell your players not to shoot from here but you must know your players and who is likely to at least hit the average on these shots. Paul Flynn probably has licence to shoot from here all day – should Jack McCaffrey? Only if you know, from data gathered in games and training, what his Success Rate is like. Inside the 20m line there is again volatility over the years but when combined there is practically no difference either. Shooting from the right or the left (Sectors 7 & 9) the Success Rates come in at 42%-43%. Which leaves us with the centre. Just under a quarter of all shots come from Sector5 whilst 50% are converted. A conversion rate of 50% may seem low for shots more or less in front of goal but in the context of a 36% Success Rate from the Sectors either side of it this is quite a fruitful avenue. Sector 8, straight in front of goals, surprises me somewhat. Remember these are deliberate attempts for points so goal shots are excluded. These should be the simplest shots in the game but yet a sizeable minority, 29%, are missed. This is where our lack of defensive reference points has a bearing. You would imagine that the vast majority of those missed shots came about due to defensive pressure. Again the level of consistency stands out. Over the three years the Success Rate from deadballs has remained static with the only fluctuations coming from those methods of delivery where volumes are low. Free kicks, as a percentage of all deadball shots, were 84.9% over the three years with a very narrow range (84.7% in ’10, 86.0% in ’12 and 84.1% in ’13). The average number of frees in a game across the three years is 12.4 – with a Success Rate of 70% your average free taker, in an average Championship game, will deliver 4.3 points. I have always wondered at the low return rates for 45s however in the context that there is only, on average, 1.76 45s a game it is easy to see why players and coaches might deem it ancillary. Much like shooting from play there are distinct groupings of sectors here. From play we saw that there was a large uptick in Success Rates for shots down the centre inside the 45m. This is also evident in the free taking returns and is extended outside the 45 as well where, unlike shots from play, a large portion of frees emanate from (14% over the three years). Again there is little difference in Success Rates for frees from the wings; 36% & 37% for frees from Sector1 & Sector3 and 56% & 58% for Sector4 & Sector6. There is some variation in the outcomes for frees inside the 21m line with 78% of frees converted from the right (Sector7) and 84% from the left (Sector9). This may be due to right footed free takers taking some frees from Sector7 that more naturally fits a left footed free taker – but that is just conjecture on my part. One last piece. Previously we mentioned certain variables that could affect the Success Rate of shots. One that was mentioned was pressure. Although I have tracked whether a shot was taken under pressure since I started doing games I have never used it. The main reason for this was that it was a subjective analysis – put 10 GAA fans in a room and they would come up with ten different definitions. The results are, more or less, as expected. Each year there is a clear downshift, as against the mean, for those shots taken under pressure and an uplift for those taken without pressure. There is also quite a bit of consistency year on year which is quite comforting – it would lead you to believe that whilst subjective how pressure is being tracked is accurate. Definitely a subject worthy of its own piece. Back at the start of Summer I wrote a piece (here for background detail) about an interesting trend I had spotted; namely that frees from the hand, contrary to popular opinion, were outperforming frees from the ground. In the back of my mind I did wonder if the mix of games I had charted had somehow skewed the results. I had charted one full season and the early parts of another season. Had this led to more ‘lower grade’ games thus perhaps capturing more below average free takers? As such I revisited the numbers after two full seasons (I think we’re over 60 games now) and … the gap has increased! The table below shows that 61% of frees from the ground are converted whilst 77% of frees from the hand are converted. The initial post had shown a 63%-75% split. In the earlier study there was a discrepancy between shots inside and outside the 20m line with frees from the ground inside the 20m line outperforming frees from the hand. The reverse was true outside the 20m line. This is no longer the case. One interesting point to note is that, despite the wider trends, frees from the ground right in front of the posts (sectors 5 & 8) outperformed frees from the hand. The easier the frees the better you are in placing the ball on the ground. The wider out the pitch you go the better you are taking the free from the hand. Emmet Ryan over at the action81 website posited that perhaps the ability of free takers to steal a few yards, whilst taking frees from the hand outside the 20m line, might explain why the returns are better for this method out on the wings. This is by far the most plausible reason as to why this could occur. It could also be that players taking frees from the ground are straining for distance/accuracy and that this is upsetting a well honed regimen. It is going to be very hard to (dis)prove either however. For now we’ll just have to contend ourselves with the knowledge that, irrespective of the reason, your free taker is better taking his shots from the hand. I have heard both Martin Carney & Martin McHugh lament the fact that the art of taking a free kick from the ground is passing. That teams are harming their own prospects by not cultivating a kicker who can take a free from the ground. Their argument, and one that I would suggest is generally accepted, is that taking frees from the ground is more constant. There are less moving parts thus the motion should be more repetitive. More repetitive leads to more reliability which leads to a better success rate (for some reason I have rugby kickers in my head as I write that). 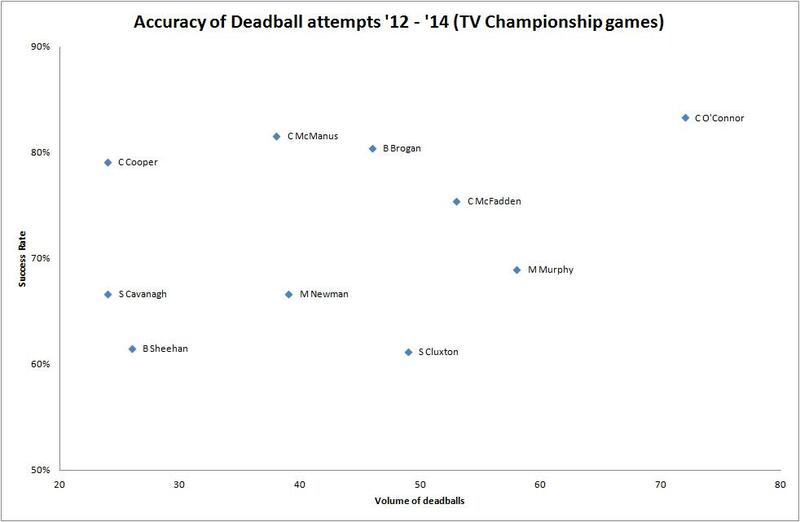 In entries to date I have noted the results of “deadballs”. This includes all shots from Sidelines, 45s, penalties and free kicks. Sidelines (from the hand) and 45s (from the ground) are the extreme of both cases; they have been omitted as they would probably skew the results. Similarly I have omitted penalties as I’ve yet to chart a missed penalty. Therefore we’ll look at all frees where a shot was attempted and monitor the success rates of those taken from the ground versus those taken from the hand. Hmmm. Frees from the hand are more successful than frees from the ground. That’s not a small sample size either; it’s unlikely to be overly affected by one very good (or very bad) free taker. The immediate counter argument I would expect is that frees from the ground are taken from harder positions on the pitch thus there is a bias inherent in looking at the whole population. Luckily we segment the pitch so below are the results for frees inside the 21m line and frees between the 21m & the 45m line. I have no problem with people pining for the loss of a particular skillset within the game (the midfield ‘fetch’ is one dying out with the advent of the shorter kick out routines) but call it what it is. Nostalgia. Don’t wrap it up in erroneous beliefs. There is no evident benefit to taking frees from the ground.